Looking for an automated way to add content, like ads or related posts, after paragraphs (<p></p>) in post content I found none that satisfied my needs completely. Creating a shortcode for this seems like an obvious candidate, but I really don’t like having to manually add shortcodes to content if there are other, more automated, methods available. One of the solutions out there consists of splitting the content at every closing </p> tag, adding the content, and joining it all back together. Other solutions rely on regular expressions to find the paragraphs, which is known to be very problematic. So, none of the existing methods found really appealed to me. Let me explain why. HTML, by nature, is a forgiving language that allows poor code to execute and render to varying levels of accuracy. This makes it a very difficult language to parse and manipulate correctly. Another difficulty is that (some) HTML elements are allowed to be nested inside other elements. Let’s consider this valid HTML, where we want to add content (automatically) after a second paragraph. Using the above-mentioned methods the content is inserted after the <p> tag inside the <blockquote>. This is a problem because you probably didn’t want to include an ad (or other content) in your carefully crafted blockquote. Both methods are not context aware, they do not take into account if it’s a nested paragraph or not. This example shows how easily it could create problems, even with valid HTML. And that’s why I’ve created a plugin to reliably insert content after top-level paragraphs only. It provides you with a function to help you insert content correctly in your (child) theme’s template files. Click this link to download the plugin WP Insert Content or visit the GitHub repository for more information. For those who want to know, it uses the PHP DOM module to parse the HTML. In this example we’re going to add content after the first paragraph in single post pages. The content we’re inserting is a link to a random post. First activate the WP Insert Content plugin. Note: It’s recommended you create a child theme first. If you upgrade the theme all our modifications (to insert the link) will be lost. // Check if the plugin WP Insert Content is activated. // Check if we're inside the main loop in a single post page. // Get a random post id. // Check if a random post id was found. // Insert content after first top-level paragraph. // Create a link to the random post. // Insert the link after the first paragraph found in post content. As you can see the plugin function insert_content() is used to add the link after the first paragraph. For more information about the insert_content() function see this repository that’s included in this plugin. I recently got this error when running PHPUnit tests for one of my plugins. After some searching I found out it was because the WordPress test framework used by PHPUnit is from a newer WordPress version as the WordPress version used for the tests. The undefined functions are not found because they don’t exist (yet) in core. The trac ticket dealing with this issue assumes you should only use the WP test framework from the installed branch. For me this scenario caused the fatal error. I’ve used the WP-CLI command wp scaffold plugin-tests to set up the unit tests for all my plugins. It generates all the files needed for running PHPUnit tests. 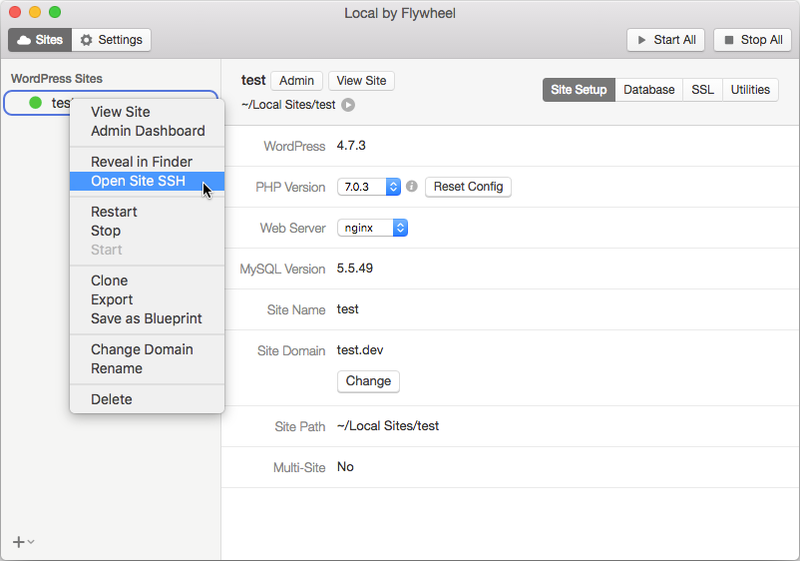 In bootstrap.php it tells PHPUnit where to find the WP test framework. As you can see it sets the directory for the WP test framework from a environment variable WP_TESTS_DIR if it exists. For testing locally I use Varying Vagrant Vagrants. This Vagrant configuration sets the WP_TESTS_DIR variable in its bash_profile to /srv/www/wordpress-develop/tests/phpunit/. So it points to the WP test framework from the development branch of WordPress. Every time you provision VVV it will update the WP test framework to the newest development version. Functions that are not yet in the WordPress versions you test against could be added to it. That’s why these fatal errors will arise in future if you don’t guard against it. There are multiple ways to solve this issue. In the trac ticket it’s suggested you create shims for the non-existent functions. Plugins as EDD and Babble have gone this route. It means you copy and paste the functions from WordPress core in a shims.php file and wrap them in a function_exists. Then include the file in your tests bootstrap.php file so the functions exists when you run the tests. For me it seems strange to include WordPress core functions in your plugin every time a new function is used in the WP testing framework. Another solution is to not use the WP_TESTS_DIR environment variable as it can point PHPUnit to a wrong version of the WP testing framework. That’s why I’ve created a pull request for WP-CLI to not use the WP_TESTS_DIR anymore in its plugin scaffolding. Unfortunately it was not approved because of back compatibility. That doesn’t mean I cannot use it for my own plugins though, as I did in this commit. Now the correct version of the WP testing framework is used when running tests. Even Travis CI sees no problem in using this solution. Download the files from this gist for your own testing environment if you prefer it over adding function shims to your plugins. Let me know in the comments what solution you use to get rid of these errors. How to remove specific shortcodes from post content. There are many ways to hide unused shortcodes, but none of these methods remove the shortcode from the post content permanently. In other words, they don’t remove the shortcode from the post content in the database. They let it linger there forever. This got me thinking on how I would tackle this problem. First off, I’ve created a plugin that lets you add shortcodes after post content. But what of all the old posts that still have shortcodes? WordPress core uses a regular expression (regex) to find the shortcodes in the post content. What better way to find a specific shortcode in the post content as with the same regular expression WordPress core uses. WordPress uses the get_shortcode_regex() function to retrieve its regular expression. This regex finds all registered shortcodes in content. All we have to do to get the regex for a specific shortcode is make the function think there is only one shortcode registered. Our specific shortcode to be precise. To show how this can be done, the following example prints the regex for the shortcode [related_posts_by_tax] from one of my plugins. For an easier way to get the regex, change the regex produced by this example or use the plugin below. // The  $shortcode_tags global variable contains all registered shortcodes. // Store the shortcode_tags global in a temporary variable. // Add only one specific shortcode name to the $shortcode_tags global. // Replace 'related_posts_by_tax' with the shortcode you want to get the regex for. // Don't include the brackets from a shortcode. // Create the regex for your shortcode. // Restore the $shortcode_tags global. The code produces this regex (WordPress 4.2.2 install). As you can see it’s pretty easy to just change the shortcode name (related_posts_by_tax) in the produced regular expression. But be aware WordPress might change it in future. To make it easier for you I’ve created a little plugin to create the regex WordPress would use to find a specific shortcode. Put it in your plugins folder and activate. The settings page is at wp-admin > Settings > Shortcode Regex Finder. I’m using the Search Regex plugin to replace shortcodes inside post content because it has one killer feature. It lets you preview what the regular expression finds before you do the replacing. This all comes with a warning though. Here it is. Always make a database backup before bulk replacing stuff in the database with a regular expression! Even if you’re use a plugin! Even if you’re 100% sure nothing bad will happen! After making a backup, install the Search Regex plugin and go to wp-admin > Tools > Search Regex. Put the regular expression for a shortcode in the “Search pattern” field, check the “Regex” checkbox and click “Search”. Leave the “Replace pattern” field empty if you want to remove the shortcode. These are the results for my [related_posts_by_tax] shortcode. As you can see, it finds the shortcode in the post content of a post. For this example it only finds one result, but imagine if you inserted a shortcode in thousands of posts. The Search Regex plugin clearly shows what will be replaced in the excellent preview of the results. If you are happy with the results, replace all instances of the shortcode by clicking “Replace & Save”. Now it’s time to go over all your posts to see if the unused shortcode was successfully removed. If not, restore your posts with the backup you made. Consider creating a review for the Search Regex plugin if this helped you out. If you know of another way of doing the same task, or if you’ve used this approach, let me know in the comments. Sort posts by multiple meta values or meta keys. WordPress doesn’t let you sort posts by multiple custom field values or keys if you’re using a meta_query. With a filter in your (child) theme’s functions.php you can order the posts with a new query parameter meta_query_orderby. The new parameter can be used in WP_Query and pre_get_posts. But as always there are some restrictions. Put this code in your (child) theme’s functions.php or create a plugin with this code in it. // Check if the query var 'meta_query_orderby' is used for this query. // Parse the query vars to retrieve the meta query sql. // Check if the meta query sql where clause was retrieved. // Get all sorting arrays custom field keys (keys are required in the sorting arrays). // Match all meta tables or meta table aliases (wp_postmeta or mt1, mt2 etc..) with meta their meta keys. // Loop through all sorting arrays. // Check if the required meta 'key' exists. // Get the numeric key from our matched keys. // Check if matched key exists. // Create sql to order by meta value. // Create sql to order by meta key. In this example we query for posts with the custom field product_type and order the posts by this (meta value) order. 'key'   => 'product_type', // Custom field key. 'value' => array( 'free', 'featured', 'premium' ), // Order of values doesn't matter. // Add more meta query arrays here if needed. To sort the posts we add the new parameter meta_query_orderby and make sure the values in the value array are in the correct order. If you don’t use the value array (or leave it empty) you can order the posts by meta key only (see the next example). // Add more custom field keys here if needed. // Custom field key sorting array. 'key'   => 'product_type', // (required) Custom field key. 'value' => array( 'featured', 'premium', 'free' ), // (optional) Order of values is important! // Add more custom field key sorting arrays here if needed. In this example we query for posts with the custom fields movie or book And we want the posts with the book custom field to show first. And on top of that we want the the posts with the movie custom field ordered by these values. 'key'   => 'movie', // Custom field key. 'value' => array( 'drama', 'action' ), // Order of values doesn't matter. 'key' => 'book', // Custom field key. 'key'   => 'book', // (required) Custom field key. 'key'   => 'movie', // (required) Custom field key. 'value' => array( 'action', 'drama' ), // (optional) Order of values is important! I’ve used this meta sorting in a few projects and have only tested it for the use cases there. One restriction is that the order in the query has to be set to DESC for it to order the posts correctly. Please don’t post your question here if it doesn’t work. Post it in the WordPress forums and give it a tag: meta query orderby. If you have any questions you can add them there. Remember, all support is handled on the WordPress Forums.